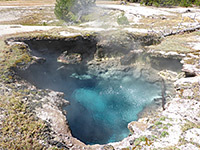 After the main area alongside the Firehole River, the second largest concentration of hot springs in Midway Geyser Basin is around the upper reaches of the Rabbit Creek, a short, east-side tributary of the river, formed entirely of run-off water from thermal pools. The springs are divided into two dispersed groups, separated by a short, wooded slope; land around the lower section is quite open, mostly extensive white flats, while the upper area is wooded and some pools are completely enclosed by dense forest. 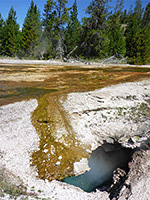 The springs are characterized by a wide range of colors and activity levels, from clear, bright blue and continually boiling, to cloudy grey or brown, and warm rather than hot. Only two seem to have an official name - Rabbit Creek Geyser and Scaffold Spring, though a few of the upper group are known informally as the Tomato Soup Pools on account of their thick, cloudy, brick red water. 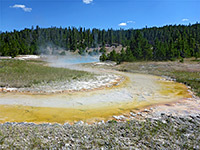 There is no trail to the springs, though they may be reached simply enough, by walking up the creek starting where it is crossed by the Grand Loop Road, between the parking areas for Fairy Falls and Grand Prismatic Spring. Some of the ground is boggy but most is firm, and it is easy to approach, and view, the springs from a safe distance. The only difficulty comes in locating some of the features in the upper basin, in particular the Tomato Soup Pools, as the trees hide them until close up, and there are no landmarks to aid in navigation. The round trip distance, visiting 40 or so significant pools, is around 3 miles, but there is a lot to see, so the hike takes longer than might be expected, three to four hours. All visitors need to be familiar with the park regulations concerning off-trail travel in the vicinity of backcountry thermal regions. 53 views of the Rabbit Creek Group; gallery, slideshow. Thermal features of the Rabbit Creek Group (mp4; 2:35 min). The nearest parking place is a pull-out on the west side of the road just south of Rabbit Creek, on the inside of a big curve, overlooking the Firehole River, within sight of steam plumes from distant geysers. The immediate land to the east is mostly treeless; flat, short grass meadows that surround the creek as it flows from the thermal area about one mile away, at the foot of a wooded hillside. 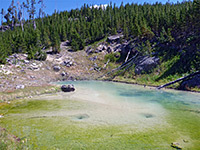 The first group of pools are just a few hundred feet from the road, on the north side of the creek; the most vigorous is filled with grey blue water, gently simmering in one place, while others are brown and less active, one at the upper end of a little tributary brook, its surface half covered by algae. The main stream is also lined with algae, more red in color. A faint path runs alongside the creek, through a patch of light woodland and back into the open, now out-of-sight of the road. 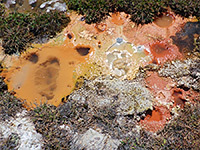 The stream is inhabited by different species of algae and cyanobacteria as the temperature increases, and as a result the color of the streambed becomes orange then pinkish, until it meets a large, steaming, turquoise-blue pool a hundred feet across; the main source of all the water. 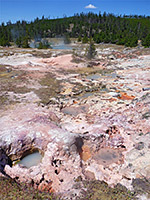 To the east are many small vents and red mud pots, one beneath a big overhang, then beyond is a hotter, simmering blue pool, at the edge of a patch of trees. Another group of springs is found a few hundred feet north, round a little corner, including four hot, blue pools and a few cooler, larger, brownish ones. Quite a steep slope rises close by to the east. 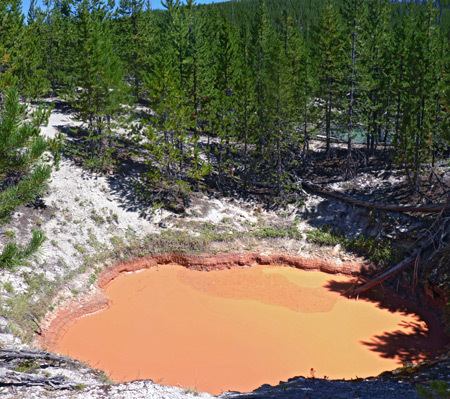 Further the south, through a narrow belt of trees, is a large, bubbling, T-shaped spring, its runoff channel lined with bright orange algae, soon joining another creek that originates from two hot, clear blue pools, this approximately at the south edge of the lower section of the thermal area. Rabbit Creek Geyser is near here; usually just a pool of bubbling water several feet below the ground level, this does on occasions erupt to form a low geyser. 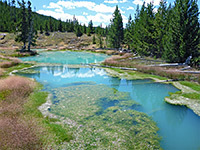 A white earth region extends uphill a little way, and along the edge is Scaffold Spring, a deep, clear-water spring containing a dozen or more submerged, criss-crossing tree trunks, with a faint ring of pale yellow algae around the rim. Past Scaffold Spring, a short eastwards climb alongside a minor drainage that later veers north, reaches a flat bench bordered to the east by a line of closely spaced, new-growth trees, and beyond this by more steep slopes, partly wooded, in other places formed of jagged, grey cliffs. 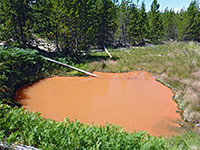 The thermal pools of the upper group, also known as Rabbit Creek Highland Springs, extend for half a mile at the foot of the slopes, and begin a few hundred feet north of the top of the drainage with a cluster of cloudy, grey-blue pools and a few reddish vents, near some bigger fumaroles that mark the north edge of the thermal area. The surroundings are somewhat marshy, covered by long grass mixed with many species of wildflowers. To the south, the next features include colorful mud pots, several large, cloudy turquoise pools, some small reddish vents and two round springs, one lined by ferns, and then a double pool, the two components linked by a short stream. The land becomes more wooded further south, and the springs are harder to locate. The next few pools are fairly small, until a larger one, filled with cloudy, orange-brown water, with a small red spring just beyond - the first of the Tomato Soup Pools. A deeper red spring is just uphill, half surrounded by a low sinter rim, the surface partly covered with a shiny film. Nearby is a very deep vent with a bubbling pool at its base. 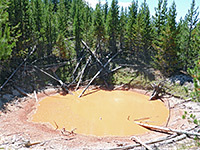 Further south, are another richly-colored red pool, and then another, beside a larger, hot grey spring. The trees now are even more closely spaced. The final pool, a little way south, is also grey, gently bubbling at one point, beside a violent, grey-white mud pot with a small, deep vent. The return route is due west, through a short patch of level woodland them down a slope, emerging to open flats near a large, grey water pool to the south. A small stream flows northwest from here, heading towards a patch of trees and meeting the main branch in less than half a mile. There are several more small, brownish pools along the way.